I separated this blog out of OakMonster.com originally because I want to keep things separated. Life on one, and food on the other. It has become obvious to me that, considering how my life is, both should live in the same space. So, I will be moving good, relevant content from here over to OakMonster.com/food. Eventually, this blog will be deleted completely. Meanwhile, OakMonster.com is where I live now. See me over there. I'm currently working on a food challenge of eating like a Hobbit for 30 days. That's seven meals a day! If there's any outstanding recipes I made during this crazy journey, I will share with you here. When I scheduled a test kitchen day at work, I didn't think about it being the first day of the Hobbit Diet. Not that it would change anything but it was interesting for me to try to log what I just made into MyFitnessPal app. What was I going to test? 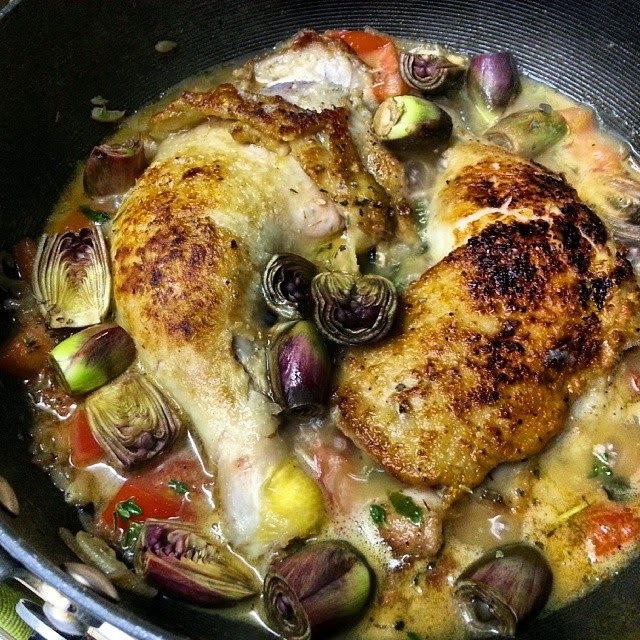 Braised Chicken with Baby Artichokes, originally from Williams-Sonoma blog. Fortunately, someone else made a similar recipe--actually, one of the recipes I considered testing--and added the calorie counts to the database. Surprisingly, this recipe is quite a healthy one at 280 calories per serving (if serving 6). My lab rats...I meant, coworkers...were VERY happy with the results. The sauce. Oh my god the sauce! It's just awesome. Easy one pot supper, I tell you! I made it again for on Day 17 at home so Brandon could try Baby Artichokes. I served it with leftover rotini pasta, and that was a great idea. Brandon like the preparation but did not care for the artichokes...or the tomatoes (of course). That is fine because now I have all the leftover to myself. For the next few days, I ate the leftover tossed in with the pasta. I think I like that even better than the chicken by itself. I haven't updated the blog since LAST YEAR? What? I guess that's what happened when most of the new recipes you made are for work. This year, I set a goal to eat like a Hobbit, seven times a day, for a month out of curiosity. Right. Who else would try to follow a fictional diet! The internal debate (between me and the voices) became where I should post the progress. While OakMonster.com is the main blog, it will be a little bit about the food I eat too. So, I'm thinking a compromise is in order. How about I post any new recipe I cooked during those 30 days here? Wouldn't that be nice? The journey started today. And there is a recipe I tested for work and ate for lunch. But I'll have to find a photo I can use for that since I didn't even think about snapping a photo for myself. I will update soon! Keep up with my #HobbitDiet 30-day challenge here. Disclosure: At press time, I am a contracted employee of Frieda's Specialty Produce. Some products are given to me as samples, some are leftover from a photo shoot, and some I purchase from an employee sale for personal use. My opinion on this blog whether it's about Frieda's products or anything else are all my own and does not reflect that of my employer's. I've known Starfruit my entire life, having grown up in Thailand. I've seen them around all the time. But frankly, I don't recall having eaten any. At least not in the past 20 years. I got to taste it for the first time in recent memory a couple of weeks ago as we tried in vain to make a Vine for Star Wars Day. We're now producing the new Specialty Produce 101 YouTube video for Starfruit and I was tasked to see if we can make something different with them outside of blending them into a smoothie or adding them into a fruit salad. 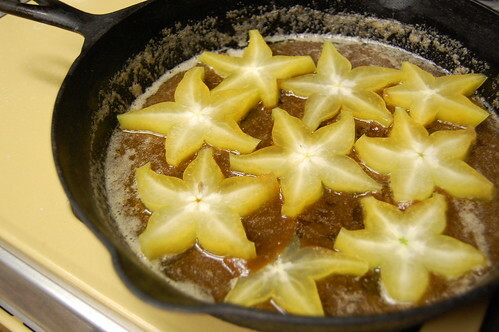 To be honest, there are not a lot of recipes out there for Starfruit that look appetizing or are simple. But then I read that Starfruit can be used instead of pineapples in some recipes. And it seems I've stumbled on a winner on Epicurious. The recipe calls for ground cardamom and comes with a warning that many people feel that 3 teaspoons of ground cardamom are too overpowering. I already have cardamom PODS--green AND black!--in my pantry from my faux-Indian cooking, but I thought I probably should pick up a thing of ground cardamom anyway. Then I saw the whopping $13 price tag. Never mind! There has got to be a way around this! Suddenly, I remembered my cardamom-infused bourbon I made a while ago for a cocktail. So I did just that with the rum needed for the recipe. The result is just a hint of cardamom that lets a little bit of pineapple shine through, a warmth that compliments the refreshing taste of the cooked Starfruit, and something just a tad savory to cut through the chewy sweet caramel. Vacation on plate, I tell you. You'll need a well-seasoned 10-inch cast-iron skillet for this. Crush 3 cardamom pods in a small bowl. Add 3 tablespoons of rum. Let stand for at least 30 minutes. Discard the pods and seeds. 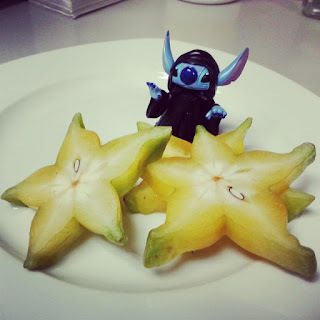 Thoroughly wash Starfruit and slice it crosswise into 1/4-inch-thick slices. Melt butter in a cast-iron skillet. Add brown sugar and simmer over moderate heat until sugar is melted and the mixture is sticky, about 4 minutes. Remove from heat. Arrange Starfruit on top of sugar mixture. Set aside. Spoon batter over pineapple topping and spread evenly. Bake until golden and a tester comes out clean, about 45 minutes. Let cake stand in skillet 5 minutes. Put a plate over skillet and invert cake onto plate. Replace any fruit stuck to bottom of skillet. 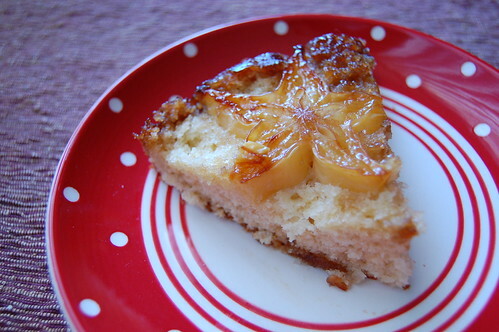 Sprinkle the remaining 2 tablespoons of cardamom-infused rum over cake and cool on plate on a rack. I think next week I might repeat this recipe but using Zululand Queen Baby Pineapples instead! I now work for Frieda's Specialty Produce and loving it. It's not permanent yet, but I'm telling you guys anyway for full disclosure. This job is a foodie's dream comes true. I get to hear about exciting fruits and vegetables every day, and once in a while I get to take something home to play with. Employee sales also yield a bounty of great loot and there is always something new to discover. For example, I was sent home with some Kale Sprouts, a hybrid of Red Russian Kale and Brussels Sprouts. Essentially, combining Brandon's favorite new vegetable and my all time favorite vegetable into one! I grabbed a recipe suggestion for Brussels Sprouts from Girl + Fire Paulette and cooked up these little purple-tinted beauties. A rough "add this and that for that much" recipe is below. I mentioned the employee sale a minute ago. The staff in the warehouse loves me now because I'm an easy target. With a little nudge, I'd buy the farm! My very first order for the sale, I didn't order correctly so there was no produce set out for me to pick up. The guy in charge just had me take a peek at all that was still available. I intended to only buy Baby Potatoes and Lady Apples. I walked out with Lady Apples, Meyer Lemons, Zululand Baby Pineapples, and Heirloom Tomatoes! The following week, I didn't have exact change, so the same guy showed me some Rambutans, and instead of trying make some change, I ended up ordering more stuff. 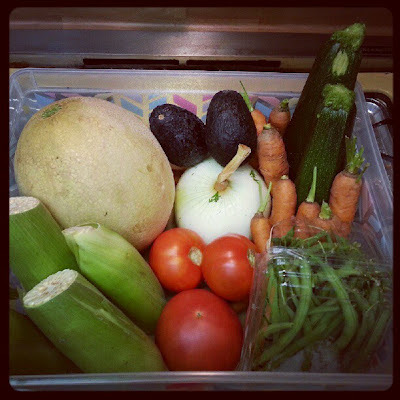 Needless to say, I went ahead and canceled my Tanaka Farms CSA (Community Supported Agriculture) subscription. I really did love that program and it was a tough one to let go of. As I told you guys, we eventually reduced our subscription about a box a month and we still can't keep up. There are only two people in this household, y'all, and one of them can be a picky eater at times. The produce just kept piling up. Going forward, Brandon and I can still have a culinary adventure whenever we feel like it, and we'll supplement the rest with the Farmer's Market on Sundays in Long Beach. That's good too because I really miss going to the market. Anyways. My new cooking adventures will be a very interesting one indeed. I hope you'll come along! Now, the "recipe" for a very addictive Kale Sprouts dish. About 3-4 oz. of Kale Sprouts. You can get them in bulk at some places and prepackaged in the other. You can just use Brussels Sprouts for this. While the bacon is cooking, prep the Kale Sprouts. Give it a wash then trim of the bottom like you'd do with Brussels Sprouts. Halve the larger ones. Leave the little ones whole. Add Kale Sprouts to the hot bacon dripping, season lightly with salt (bacon is already salty!). Saute for a few minutes until the Sprouts wilt a little. Add a splash of water/broth to de-glaze the pan. Add garlic. Once it comes to bubbling/sizzling, let reduce a bit, [if using Brussels Sprouts, until they're fork tender]. Add the pat of butter, brown sugar, and the bacon. Toss to coat. Season to taste. Well, just so y'all know. 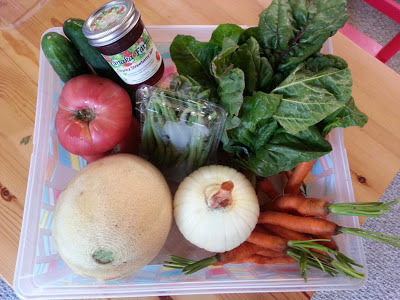 I'm still getting the CSA box but with less frequency. Even with every other week delivery, we still couldn't go through that much produce. You know how it is in this mood-eating household. Having said that, we have had some great experiments with mystery vegetables like kohlrabi, and veggies we never had before like rainbow and Swiss chard. It's been quite fun. I've taken tons of photos but I haven't blogged about them yet. I'm a horrible blogger. I apologize for the lapses! Box #7 came is just as we were going away on a trip so it was a little hectic. And I had forgotten that I didn't post about it until I went to pick up #8....which I also forgot to pick up on Friday. I know. For somebody who doesn't have a job, I'm crazy busy. There are also many factors to contribute to my slight disinterest in the past few boxes. Firstly, there was not much to be excited about. The selection hasn't been all that challenging. And then there is the weather. I know for most people cooking in the summer isn't such a big deal. But to be in an apartment above the garage with a small A/C that only cools down your general living area, turning on the stove means turning up the A/C. At some point, the $200 electrical bill really doesn't justify the cooking. And finally, we had been quite busy with just about everything else we barely stayed home for dinner. 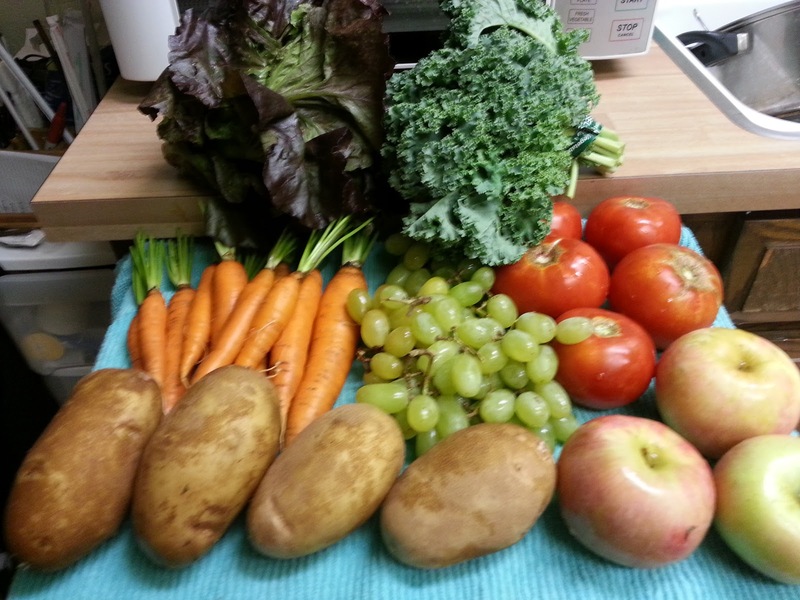 With all of those factors, I found myself having to throw out a lot of produce. A head of lettuce from Box #6 which was already a bit banged up when I got it didn't stay around long enough for me to process. Two sweet onions, one from Box #6 and one from #7, waited for French onion soup weather patiently in the fridge until mold took them along with a bunch of carrots and green beans from the same boxes. My tailgate at USC rescued my zucchinis and some of the carrots a few time as I tossed them in some zip-top bags with olive oil, balsamic vinegar, a little garlic powder and salt and pepper, and the boys grilled them. I did change them from "Vegetables? What's that?" to "Wow, those were the best zucchini I ever had!" My mission here is done. From Box #6, cantaloupe got very ripe. I found a recipe to turn it into a sorbet by pureeing the flesh and added a little simple syrup, then freezing the mixture like you would ice cream. It is really a refreshing treat to have in this heat we have. Box #7 cantaloupe is sitting in the fridge, waiting its turn any day now. Zucchinis. Heirloom tomatoes. Green beans. Swiss chard. Cantaloupe. Sweet onion. Carrots. A jar of Tanaka Farm strawberry jams. Swiss chard was new to me. I decided to braise it with bacon and beer like I did with the kale. I didn't care for the earthiness of the chard though. Brandon didn't mind it too much. Surprise! And here's Box #8 from a few Fridays ago. Purple lettuce. Kale. Carrots. Grapes. Tomatoes. Potatoes. Apples. Olaina once again took home some tomatoes. The grapes were eaten almost immediately. They were so good! 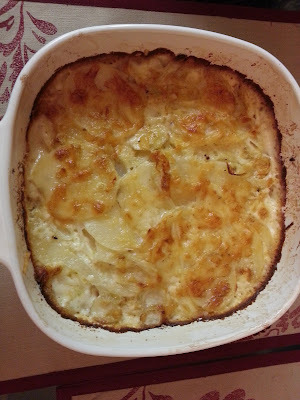 I used 2 potatoes in this wonderful Ina Garten's potato fennel gratin which I tweaked to do half portion and added a little garlic. Super addictive. As a matter of fact, I'm going to make some tonight! Oh, and the kale. I made kale chips this time. And oh my gosh, I can NOT stop eating them! Why do I even bother braising this every again? LOL Just trim off the stems. Toss with olive oil and salt. Bake at 300F for 20 minutes. That's it. That's all. Well, there you go. Tomorrow I'm getting Box #9 and I'll be back on the bi-weekly track to post about them. The challenge with the last box was the cabbage. I attacked that with a summer kimchi recipe I found. Being a lazy bum that I am, I didn't get to the Korean market to purchase the actual Koren chili powder (gochugaru)--I experimented with my own blend with arbol chili, chili powder, cayenne, and paprika. It was a success to a degree, but after I portioned it out for a few folks to try, I decided to toss it out. Just not up to my standard. Next time, full scale recipe! I did make colcannon-- sauteed cabbage mashed in with potatoes--with frozen cabbage from a few weeks before to go with the bangers I got. I never knew that cabbage and potatoes would take THAT good mashed together! However, Southern California weather had heated up considerably these past few weeks. I barely cooked anything! The green beans and the carrots ended up getting blanched and frozen because I just didn't want to slave over the stove in this heat. I will definitely re-do the awesome beef and broccoli recipe again. This time I will take a picture of the end product and will post recipe...eventually. The carrots will get glazed. The green beans will get steamed. I'm unsure of what I'm going to do for the protein yet but that's the game plan so far. Zucchini is this week's contender. I have done zucchini soup two ways before, so I might revisit the hot zucchini-leek soup as I wasn't a big fan of the chilled one. Do you have any good zucchini recipe that does not involved turning on an oven?